We’ve added a Pumpkin Spice Ale to our rotating taps just in time for autumn and you won’t want to miss it! This new brew has a spicy aroma with notes of cinnamon, nutmeg, and allspice, which give way to a rich and delicious pumpkin flavour. 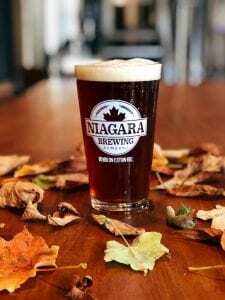 Whether you try it in a pint or a flight, this ale is a great way to get into the spirit of autumn and is one of our favourite things about the season – along with the incredible foliage and cozy sweater weather, of course. We also currently offer broasted (broiled and roasted) chicken fingers and wings on our newly-updated kitchen menu, which pair perfectly with our beer and make for some tasty eating. So come by the brewery to taste all of our new offerings and raise a glass to a spectacular new season in Niagara!